Damen Marine Components (DMC) has signed its first order with Tersan Tersanecilik, a Turkish shipyard. The order is for a single, customised Barke rudder with a surface area of 16 sq m and a Commader rotary vane steering gear that delivers a torque of up to 430 kNm. Tersan Tersanecilik is based at Yalova City on the Sea of Marmara, and the equipment will be installed on a 108-metre Factory Freezer Trawler vessel, said a statement. 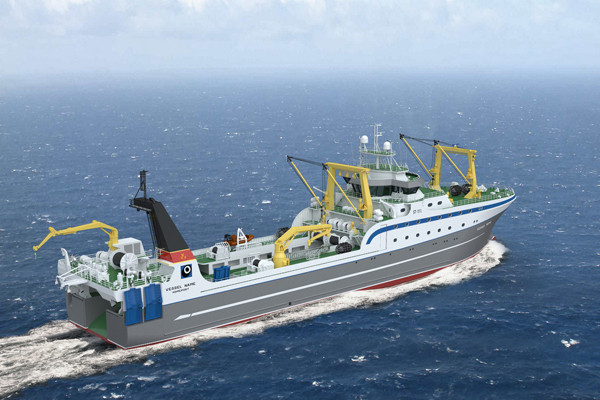 Designed by Skipsteknisk, design number STL191L, she is currently in build for the Russian fishing fleet operator JSC PT Okeanrybflot, it said. In addition to the hydraulic components of the rotary vane, DMC will deliver indicators and controls; follow-up, non-follow-up in Main Bridge, follow-up in wings and follow-up in AFT. The system is classified RMRS KM, ICE3, AUT 2, REF, Fishing Vessel and is scheduled for delivery in December this year. Damen’s Barke rudder is ideal for vessels such as large fishing trawlers. It is a highly robust and reliable design that delivers excellent manoeuvring performance while at the same time being noise and vibration-free. With the flap linkage sheltered in a streamlined housing it is protected from ice, sand and floating objects and the mechanical components are contained in a grease-lubricated housing. Additional features that make the Barke rudder a dependable steerage solution is its overload protection; the flap linkage is safe from impact in the event of excessive force being applied and rudder movement is restricted should the flap become blocked. The flap linkage and bearings are designed with minimum clearance to ensure the least possible vibration, noise and wear.